[140 Pages Report] The composite decking market & railing market is estimated to grow from USD 1.70 Billion in 2015 to USD 3.09 Billion by 2020, at a compound annual growth rate (CAGR) of 12.60% from 2015 to 2020. The report aims at estimating the market size and future growth potential of composite decking & railing market across different segments such as application, type, resin types, and region. The base year considered for the study is 2014 and the market size is forecasted from 2015 to 2020. A shift in the trend from natural wood towards composite decking & railing is witnessed. Composite decking & railing offers properties such as low thermal expansion, resistance to slip and colour fading and a few others resulting in increased demand of the product. Capped composite decking & railing product is expected to substantially increase the growth of the market during the forecast period. The research methodology used to estimate and forecast the composite decking market & railing market begins with capturing data on key company revenues and raw material costs through secondary research. The product offerings are also taken into consideration to determine the market segmentation. The bottom-up procedure was employed to arrive at the overall market size of the global composite decking & railing from the revenue of the key players in the market. After arriving at the overall market size, the total market was split into several segments and sub-segments which are then verified through primary research by conducting extensive interviews with key people such as CEOs, VPs, Directors and executives. This data triangulation and market breakdown procedures were employed to complete the overall market engineering process and arrive at the exact statistics for all segments and sub-segments. The composite decking market & railing market comprises of manufacturers such as Trex Company, Inc. (U.S.), UPM Biocomposites (Finland), Advanced Environmental Recycling Technologies, Inc. (U.S.), TAMKO Building Products, Inc. (U.S.), TimberTech (U.S.) and so on. Study answers several questions for the stakeholders, primarily which market segments to focus in next two to five years for prioritizing the efforts and investments. MarketsandMarkets expects the global composite decking market & railing market to grow from USD 1.70 Billion in 2015 to USD 3.09 Billion by 2020, at a compound annual growth rate (CAGR) of 12.60% from 2015 to 2020. The global composite decking & railing market has witnessed a strong growth in the past few years considering the high demand of capped composites in the U.S., Germany and developing countries such as Middle East, Brazil and China. The growing construction industry in these countries is driving the composite decking market & railing market. The major applications of composite decking & railing are in residential and non-residential sectors. The non-residential application is the fastest growing application in composite decking market & railing market during the forecast period. The properties offered by composite decking & railing such as resistance to thermal expansion and contraction when exposed to sunlight, resistance to splinter & rot and so on, is useful in application areas such as docks, marinas, patios, pool areas, hotels and resorts. The major resins used for the manufacturing of composite decking & railing include polyethylene, polypropylene and polyvinylchloride. The polyethylene based composite decking & railing has the largest market share in the global composite decking & railing market. Polyethylene resin has high strength and stiffness which is ideal for residential application requiring joist 16 inch on center. Polypropylene composite decking & railing is the fastest growing resin type in the composite decking & railing market globally. Polypropylene resin resists thermal expansion & contraction, making it useful in production of composite decking & railing in high temperature regions. The composite decking market & railing market is majorly dominated by capped composites type because of its properties such as resistance to splintering, rotting, growth of mold & mildew, and color fading. Capped composites also provide ultralow maintenance cost and superior aesthetics as compared to natural wood decking & railing products. They are widely used in residential and non-residential applications due to its physical properties. North America is the major market for capped composite decking & railing. It is also the biggest non-residential market for composite decking & railing, followed by Europe .The introduction of capped composites in RoW and Asia-Pacific region along with increasing product awareness and the benefits associated with it, is projected to witness high growth rate during the forecast period. These are some of the factors driving the capped composites in composite decking & railing market. Currently, North America is the largest consumer of composite decking & railing. U.S., Germany, and China are among the major markets of composite decking & railing. 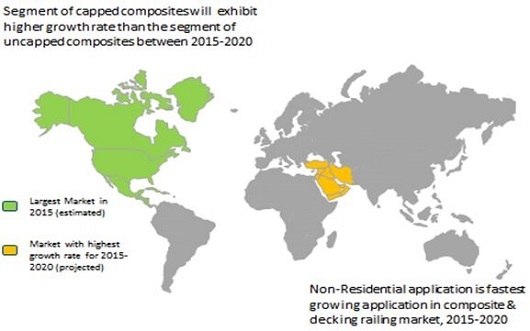 The Middle East market for composite decking & railing within the RoW region is projected to register the highest CAGR during the forecast period. The growth of the construction industry and improving financial condition in the region has led to an increase in the demand of composite decking & railing. Cellular PVC decking, aluminum decking & railing products are some of the substitute products available in the decking & railing market. They constitute a micro share in the decking & railing market. Trex Company, Inc. (U.S.) is the leading player in the composite decking market & railing market. The large scale of their operations offers cost efficiency in manufacturing, marketing and sale of composite decking. 12.5 Tamko Building Products, Inc.